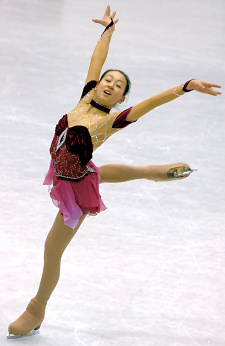 Japan's Mao Asada, 17, won the Ladies title at her first Four Continents Figure Skating Championships. The 2008 ISU Four Continents Figure Skating Championships concluded with the Ladies Long Program. Japan’s Mao Asada maintained her lead to win the gold at her first appearance at this event, while teammate Miki Ando slipped to third to settle from bronze. Joannie Rochette of Canada rose from third after the short program, to second overall to capture the silver. Performing to music from the Don Juan soundtrack, Rochette nailed her opening triple Lutz-double toeloop-double loop, followed by a solid triple flip and triple loop. The Canadian champion landed two more clean triples before underrotating and stumbling out of her second jump on a on a triple toeloop-triple Salchow sequence. The 22-year-old, who stayed in character throughout her routine, also had a slight step out on a double Axel-double Axel sequence, but otherwise produced good level 3 straightline footwork, a very good spiral sequence, and two level 4 spins. Rochette placed second in the long with a new personal best of 119.50 (63.40/56.10) points, and rose from third to second overall with a total of 179.54 points. Asada nailed her opening triple Axel which received +1.86 GOEs in her routine to Fantaisie Impromptu by Frederic Chopin, but then underrotated the second jump in a triple flip-triple toeloop combination. She was penalized for using the wrong take-off edge on a triple Lutz, but didn’t didn’t make any more mistakes in her program. The rest of her elements, including an excellent level 4 spiral sequence, all received positive GOEs. The Japanese champion also landed three more clean triple jumps, as well as a two double Axels (one in combination with a double loop-double loop). Asada also impressed with very good level 3 straightline footwork, and earned a level 4 for two of her spins. She secured a whopping 132.31 (71.91/60.40) points from the judges for a first place finish in the long and overall (193.25 points). Ando, who skated last, had a rough start in her Carmen routine. The current World champion doubled the second jump of her planned triple Lutz-triple toeloop, and then doubled and stepped out of a planned quadruple Salchow. She recovered quickly to produce four more triple triple jumps, as well as a double Axel-double loop combination. The Japanese silver medalist also earned a level 4 on three of her spins, and was awarded positive GOES on all elements except for her first two jump passes. Despite the mistakes on the jumps, the 20-year-old placed third in the long with a seasonal best of 117.59 (60.85/56.74) points, but slipped to third overall with a total score of 177.66 points. Na-Young Kim of South Korea placed fourth in the long with a new personal best 105.41 (58.27/47.14) points. The current South Korean junior champion opened her delightful program to Russian Gypsy music with a triple flip-double toeloop, followed by a double Axel-double Axel sequence, and a triple Lutz-double toeloop. The underrotated and stepped out of a triple toeloop, but otherwise landed two more triples jumps, as well as a double Axel. Kim also racked up positive GOEs on many of her non-jumping elements, including three level 4 spins and a very good level 3 layback spin. The 17-year-old student from Incheon rose from sixth to fourth place overall with a total score of 158.49 points. USA’s Ashley Wagner, who stood in 12th after the short, earned 105.17 (57.50/47.67) points for a fifth place finish in the long for her routine to Tango Jalousie and Mambo Jambo. The 16-year-old received a deduction for her opening triple Lutz (in combination with an underrotated triple loop), as well as her second triple Lutz later. Nevertheless, the current World Junior bronze medalist otherwise landed four more triple jumps and a solid double Axel. The U.S. bronze medalist also earned a level 4 on her layback spin and spiral sequence, and with a total score of 152.46 points, rose to eighth place overall. Mira Leung of Canada opened her routine with a triple Lutz-double loop, followed by a triple flip, but then stepped out of the landing of a triple Salchow and later underrotated a triple toeloop. The 18-year-old otherwise landed landed two more triple jumps, as well as a double Axel-double toeloop-double loop combination, and earned a level 4 on three of her spins. The Canadian silver medalist placed sixth in the long with a new personal best of 104.35 (57.66/46.69) points for inspiring routine to piano concertos by Rachmaninov, and with a total score of 157.36 points, rose from seventh to fifth place overall. USA’s Katrina Hacker appeared focused and determined when she took the ice. The 17-year-old landed five triple jumps in her routine to Concerto de Aranjuez by Joaquin Rodrigo. She also produced an excellent level 4 change combination spin, as well as a very nice layback spin at the end of her program. The judges awarded the American a new personal best of 104.00 (58.25/ 45.75) points for a seventh place finish in the long, and with a total score of 153.86 points, she rose from 10th to sixth place overall in her first appearance at this event. Canada’s Cynthia Phaneuf opened her program with a triple toeloop-double Axel sequence and a triple Lutz-double toeloop, but then fell on a triple flip and later fell on her third jump in a triple toeloop-double toeloop-double loop combination. The 20-year-old otherwise executed a very good level 4 change combination spin and a level 4 spiral sequence. The Canadian bronze medalist placed eighth in the long with a new personal best of 102.04 (56.38/47.66) points for her routine to Claire de Lune by Claude Debussy, but with a total score of 152.67 points, rose from eighth to seventh place overall. Phaneuf did well between 2003-2005, winning the Canadian title, placing second at Four Continents, and finishing first and second in her first two senior Grand Prix events. However, she sat out the 2005-06 season to recover from injuries, and didn’t come back until the 2007 Canadian Championships where she finished fourth. Fumie Suguri of Japan finished ninth in the long with 94.82 (47.44/47.38) points, and with a total score of 145.06 points, placed 10th overall. The 27-year-old singled a flip in combination with a double toeloop, as well as a Lutz later in the program. She also stepped out of a triple flip, but otherwise showed good speed on her level 4 spiral sequence which received +0.57 GOE. Anastasia Gimazetdinova of Uzbekistan produced five triple jumps in her program, however, but received lower levels for her spins compared to that of the top competitors. She finished 10th in the long with 94.58 (48.29/46.29) points, and slipped to ninth overall with 150.07 points. USA’s Beatrisa Liang, who stood in fifth after the short program, took a fall on a triple toeloop and double Axel. The 19-year-old also singled a loop and doubled a Lutz in her routine to Yellow River Concerto by Xian Xinghai. She placed 11th in the long (90.20 points) and fell to 11th overall with 144.25 points. China’s Yueren Wang, Binshu Xu, and Yan Liu placed 11th, 12th, and 13th, respectively.